The 25-year-old was recommended to the Betfred League One club by respected coach Ian Tattersall and did enough during the pre-season campaign to win himself a contract for the 2019 campaign. Dixon missed Sunday’s game at Whitehaven after suffering a shoulder injury in the previous game against Coventry Bears in the Coral Challenge Cup. He is currently receiving treatment at the club while he awaits a scan. “Hopefully the shoulder injury is not serious and he’ll soon be back playing,” said assistant coach Pete Green. “I think everyone knew that Ryan could play but what has pleasantly surprised me has been his attitude and willingness to learn and work hard. “He’s been brilliant and I’m chuffed to bits. He’s got better each game. I thought his first half display against Coventry was the most complete half he’s played. “It’s an old injury,” said Dixon, who joined Toll Bar a couple of years ago after moving to the Doncaster from the Bradford area where he played stand-off in his junior days. Dixon says he was delighted with how things had been going prior to the injury. “I love playing rugby so I’m enjoying it,” he said. “The Keepmoat is a great stadium to play at. “I’m happy with the start I’ve made and hopefully I can keep getting a shirt when I’m fit again. “I know there is going to be a lot of competition in the second-row when Brad (England) and Frankie (Mariano) are fit again but you need that strength in depth because you never know when you are going to pick up injuries. “There is definitely a jump up in class from the amateur game both in terms of speed and skill level though I haven’t felt out of place in the games that I’ve played. “It’s a bit more physical and I’ve probably picked up knocks that I wouldn’t have done in the amateur game. 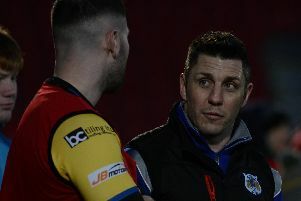 “We’ve won two out of four – against four tough teams – and it should have been three because we should have beaten Hunslet.